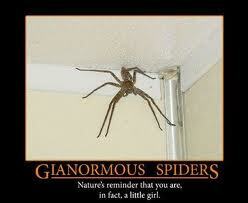 Anyone who knows me well can vouch for my insane fear of spiders. I’m not just talking about a little discomfort when I see one. I have a serious aversion to those disgusting, hairy, eight-legged, beady-eyed, dream-haunting monsters. I know girls are supposed to be afraid of mice or snakes, but the only thing that would make a snake scary to me is if it had a spider on its back. 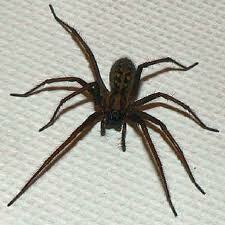 I’d curl up to snuggle with a thousand mice before I’d even think of coming within two feet of a spider voluntarily. I can’t explain my phobia, because it’s completely beyond all reason. All I know is, if there’s a spider in my room, I ain’t sleeping until I know that sucker is dead! Speaking of fears that are completely unfounded, I threw myself into a full panic attack on the eve of “Meet the Parents” weekend with my boyfriend’s family. I had never been so nervous to meet a person’s parents before, and when I felt the panic attack coming on, I actually got annoyed at myself. I felt like Lisa Kudrow in “Romy and Michelle’s High School Reunion” when she got hit by a limosine in her dream sequence, uttering an “Oh, COME ON! !” to myself. For some reason, my mind’s eye had built up a kind of scenario where I had grown a third arm, or some other disfiguring quality that would cause his family to run away screaming at the sight of me. When you feel so strongly that a person has been brought into your life for a reason, one can’t help but wonder if that reason is to bring complete terror upon his loved ones at the sight of your anxiety-induced deformity of choice. Despite all comfort from him that his family would love me, I couldn’t shut off that fear in my mind, so I spent the evening in the fetal position shivering like I had been forced to touch a spider for an eighteenth of a second. I have no idea how my boyfriend tolerates my insecurities and complete terror of harmless things…it must be the crushed-up Adderall I put in his drink when he’s not looking. Obviously, meeting the parents went nothing like Greg Focker’s experience, and I had an absolutely wonderful weekend with my boyfriend’s family and friends. But I am left wondering…what is really scarier: holding a spider or meeting the parents? Maybe all my anxiety about the creepiness of spiders (blech!!) is no different from the unnecessary anxiety prior to meeting the boyfriend’s parents. Maybe if I just get close and hold a spider for a few seconds, I’ll learn that there’s really nothing to be afraid of. 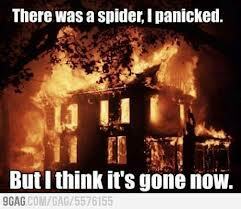 I don’t much care for spiders, but I’m the designated spider killer in the house. I don’t much care for snakes or mice, either, but I’m willing to let the snakes eat the mice, as long as it’s outside. What I really have a problem with? Asparagus. No, really. I was forced to eat some back in military school, and ended up painting the walls of the nearest bathroom to the dining hall (out the door, up two flights of stairs) with it. I have not eaten any since, and I refer to it as “kryptonite”. My wife, on the other hand, loves it. So, being a good husband, I cook it for her… inside my lead armor. LOL!!! Wow, I can definitely understand not wanting to eat asparagus after projectile vomiting :). Keep up the job as designated spider-killer!